Do you still care to know what is happening here? Cattle prices continue to fall, and winter seems never ending. Why don't you write? Are you never coming back and afraid to tell me . . .
Winter certainly seems never ending here. The trees are still bare, without sign of bud or bloom, and deep beneath a thick blanket of snow, the front garden still sleeps. Will it ever wake? Even the birds seem restless for spring. They flit and fly erratically through the grey sky in search, it seems, of something just out of reach. 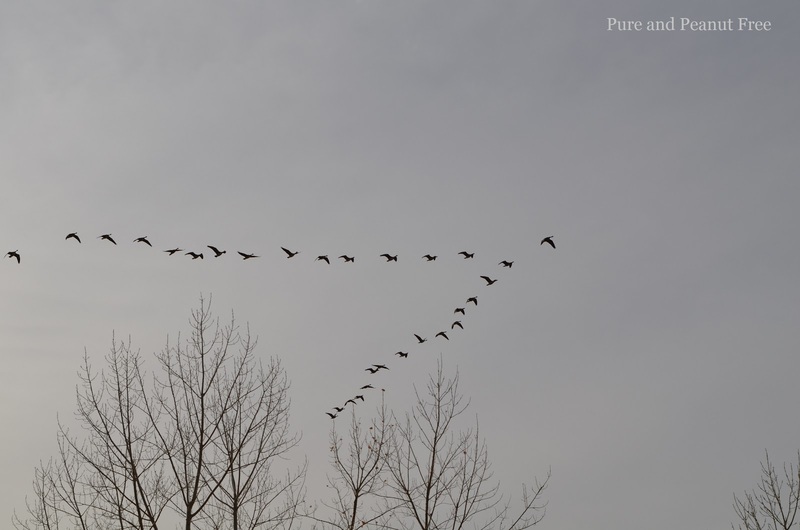 The Canadian geese still lie huddled together on the frozen pond down the road, the warmth of their bodies creating a myriad of small holes in the ice through which they dangle their webbed toes in the frigid water. As much as I love their presence as they arch across the leaden sky, I wish they would go home, and signal the start of spring. If winter is good for nothing else, it's good movies and very good for baking. So as long as it sticks around, I will continue to bake. 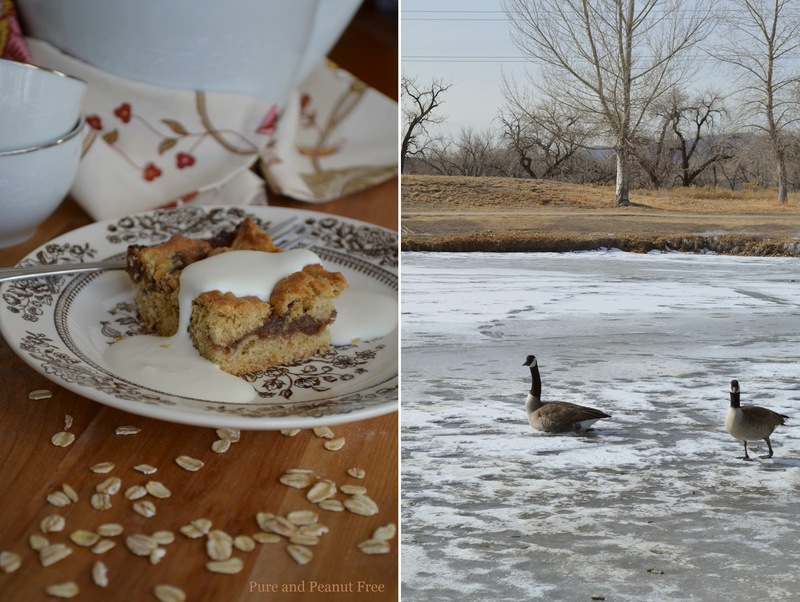 When I first started dreaming of these maple-date bars, I imagined something with a rich, luxurious maple flavour that stretched though and through - from crust to filling, and even to the thick cream on top. Sadly, all the recipes I came across skimped on the maple syrup, using it only in the filling and relying on granulated or brown sugar to sweeten the crust. That's not what I was after, so I came up with these: a hearty dessert bar full of the earthy sweetness of dates and maple syrup. A perfect combination, if you ask me. And topped with a rich dollop of maple sweetened cream, whipped just a bit to add body and a luscious texture. The date filling is enhanced with the essence of orange, which lightens it just a bit. The whole thing conjures up images of a dense and snow covered sugar maple forest. The trees tapped and waiting in silent anticipation for a spring thaw that seems as distant as a faraway dream. A scene not unlike the one outside my window as I write this. PS . . . Bonus points to the person who can name the movie from which I quoted. Any Brad Pitt fans? Preheat your oven to 400 F (200 C). Generously butter a 13 x 9 inch baking pan. Prepare the filling by mixing the water, dates, and 2 Tbsp maple syrup in a small sauce pan. Bring to a boil and simmer for 7 minutes, until the mixture is very thick and resembles jam. Remove from the heat and stir in the orange extract. Set aside while you prepare the crust. In a large mixing bowl, whisk the butter and 2/3 cup maple syrup together until smooth. (Make sure the syrup is at room temp. or warm to keep the butter from congealing). Stir in the flour, oats, baking soda, and fine sea salt. The mixture will be moist and sticky. Using your fingers, spread and press 2/3 of the mixture into the bottom of the greased baking dish (it helps if your fingers are slightly damp). Spread the date filling evenly over top. Spread the remaining dough on top of the filling with damp fingers. It's fine if some of the filling shows through. Sprinkle the fleur de sel on top. Bake for 25 minutes. Allow to cool before slicing into 18 bars. When ready to serve, combine the cream and maple syrup in a cold bowl. Whisk until the cream has some body, but can still be poured. 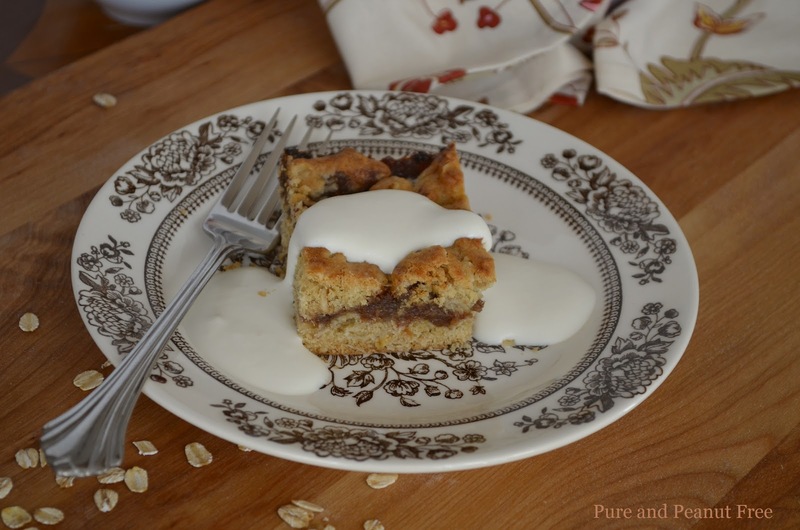 Top each bar with a drizzle of the maple cream. I had to Google your quote so I won't say what movie it's from as that would spoil it for someone who does know - I still haven't seen it yet! Your Maple Date Bars sound absolutely delicious. I love baked goods with dates in them, and I like the idea of adding the orange extract too. Thank you for sharing this post with the Hearth and Soul hop.